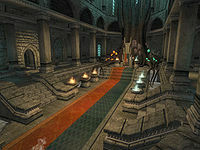 The Palace of Sheogorath is the central wing of the New Sheoth Palace, and the seat of power for the Madgod Sheogorath. The palace serves as a hub during the main quest, with most quests being started and finished here, as this is the primary location of Lord Sheogorath. The palace consists of an oval-shaped throne room with an extremely high ceiling which is divided equally between Mania and Dementia, as can be seen from the two-color carpet, the different types of flames in the braziers and the tapestries adorning the opposite walls. Sheogorath's throne is found at the eastern end of the room, just in front of a huge root laden with mushrooms, which in turn holds the Font of Madness, a magical fountain from which the madness of the whole Isles stems. All across the room are small stone pedestals placed in alcoves: upon complete of each quest of the main story line, a small souvenir will be placed on one in your honor. Although this is the court of the Madgod, there is nothing of real value, and the chamber effectively acts as a nexus to various parts of the palace. From here doors lead to the House of Mania, the House of Dementia, the palace grounds and The Fountainhead (only during the quest The Roots of Madness). This page was last modified on 13 August 2013, at 01:29.